Vocabulary Stretches: Students preview the lesson words and are provided with an example of the word used in context. 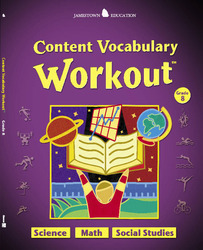 Vocabulary Workout: Students re-read key terms in a content-based context. Vocabulary Cooldown: Students solidify meaning while developing fluency and automaticity. Vocabulary Assessment: Students reinforce their knowledge every five lessons. Self-scoring: Students track their progress in a chart at the back of the book. Personal Dictionary: Students track and explore the meanings of additional vocabulary words. Each consumable grade-level book contains 30 lessons equally divided among three subject areas: math, science, and social studies.